At any given moment, somewhere in the world someone struggles with the same software design problems you have. You know you don't want to reinvent the wheel (or worse, a flat tire), so you look to Design Patternsthe lessons learned by those who've faced the same problems. With Design Patterns, you get to take advantage of the best practices and experience of others, so that you can spend your time on...something else. Something more challenging. Something more complex. Something more fun. You want to learn about the patterns that matterwhy to use them, when to use them, how to use them (and when NOT to use them). But you don't just want to see how patterns look in a book, you want to know how they look "in the wild". In their native environment. In other words, in real world applications. You also want to learn how patterns are used in the Java API, and how to exploit Java's built-in pattern support in your own code. With Head First Design Patterns, you'll avoid the embarrassment of thinking Decorator is something from the "Trading Spaces" show. Best of all, in a way that won't put you to sleep! We think your time is too important (and too short) to spend it struggling with academic texts.If you've read a Head First book, you know what to expecta visually rich format designed for the way your brain works. 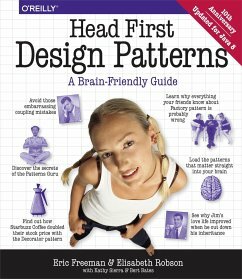 Using the latest research in neurobiology, cognitive science, and learning theory, Head First Design Patterns will load patterns into your brain in a way that sticks. In a way that lets you put them to work immediately. In a way that makes you better at solving software design problems, and better at speaking the language of patterns with others on your team. What’s so special about design patterns? At any given moment, someone struggles with the same software design problems you have. And, chances are, someone else has already solved your problem. This edition of Head First Design Patterns—now updated for Java 8—shows you the tried-and-true, road-tested patterns used by developers to create functional, elegant, reusable, and flexible software. By the time you finish this book, you’ll be able to take advantage of the best design practices and experiences of those who have fought the beast of software design and triumphed. What’s so special about this book? We think your time is too valuable to spend struggling with new concepts. 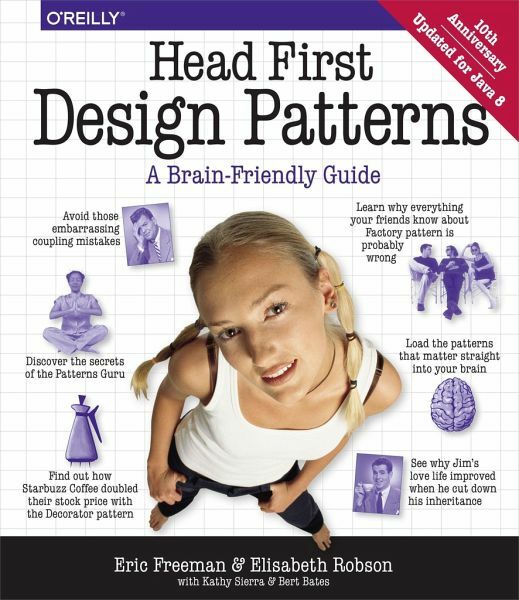 Using the latest research in cognitive science and learning theory to craft a multi-sensory learning experience, Head First Design Patterns uses a visually rich format designed for the way your brain works, not a text-heavy approach that puts you to sleep. Verlag: O'Reilly Media, Inc. / O'Reilly UK Ltd.
Eric Freeman is a computer scientist with a passion for media and software architectures and coauthor of Head First Design Patterns. He just wrapped up four years at a dream job-- directing internet broadband and wireless efforts at Disney--and is now back to writing, creating cool software, and hacking Java and Macs. "Die Head First Serie von O'Reilly verspricht hier eine völlig neue Herangehensweise, in dem die Sinne des Lesers weniger durch Textwüsten als vielmehr durch eine abwechslungsreiche Gestaltung der Inhalte angesprochen werden. Und dieses Konzept funktioniert: Anschaulicher und unterhaltsamer ist das Thema der Entwurfsmuster wohl kaum zu bewältigen. Dabei verwenden die Autoren zahlreiche Beispiele und regen immer wieder zum Hinterfragen des Erlernten im "Objektdorf" (Objectville) an."